Counselling4Carers provides a safe and confidential space for you to come and talk about any fears, hopes and difficulties you may be experiencing in your role as a carer. Perhaps you are working full time and caring, or perhaps you are a 24/7 carer, or maybe you are juggling your own family whilst looking after an elderly relative or a sick family member... whatever the situation you find yourself in, it can be really helpful to have some time for you where you can openly and honestly talk in an understanding and non-judgmental environment. As a carer myself for many years I understand the value of a positive support network for the carer as well as the cared for. After all, who cares for the carer? It is vital that carers look after their own physical and emotional wellbeing. 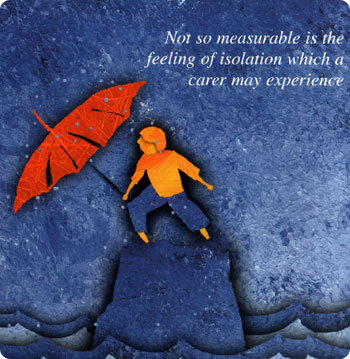 If you as a carer do not look after yourself and you become ill who is there to take your place? I know how hard it is to put yourself first when you are dedicated to caring for someone else, but it is the most valuable thing you can do and it an essential part of your caring role. "It is my vision to provide access to counsellors for all carers as an invaluable part of their support network."